I've been on a serious kick lately to try to outsource simple tasks and simplify my life. There are a few easy things that you can do in 2018 to stress less and spend more time doing things that you love doing. You hear of the standard new years resolutions that include working out more, eating healthy, and waking up earlier. 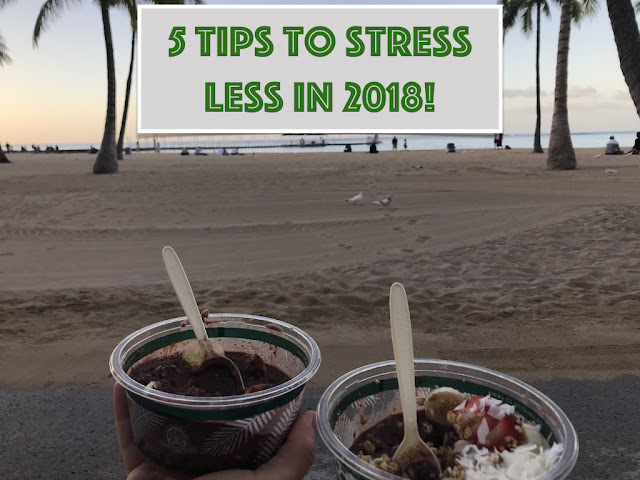 But I think these tips can help you spend more time on the things you want to do to better yourself and are easy to set up once and not think about again! Unsubscribe from emails that you don't read or enjoy. I've found this one to be easier now that I'm transitioning to a new email. It's so easy to get caught up opening the 100 emails that you receive in a day, but how often are you actually getting something new out of them. 9 times out of 10 the same discount code is listed on the top of that website, so if you really wanted to know about a sale or buy something from a website, you would learn about it when you went to their homepage. It used to be exciting to get lots of emails, but now you find they're just a distraction from the emails that you really want to read. UNSUBSCRIBE! Outsource those annoying personal tasks. I recently found a dry cleaner that will pick up my dry cleaning and drop it off with no additional fee. They literally have an app that you can request your pick up time and drop off time. One less stop. One less weekend errand. It's amazing what you can find on google by just searching for the tasks that you don't want to do anymore. I'm sure you could find someone to come pick up your dog to be groomed, shovel your driveway or even get a meal delivery service if you hate cooking. Order your groceries online. There are many companies out there that you can subscribe to and get your groceries delivered straight to your doorstep. They may be slightly more expensive (Shipt is about $5 more expensive on a $35 order), but think of that money spent for your time back and no stress about just buying food items that catch your eye, but you don't really need. Automate monthly payments. You know your car payment is the same amount every month and due on the same date every month. Why bother adding that to your to do list every month. Most banks allow you to set up an automatic payment on the same day every month. Make it one less thing on your to do list and few more minutes of "you time". Use your google calendar as a reminder system. While the calendar feature is a great way to keep track of what you're doing every weekend. It's also a great way to be reminded of those pesky day-to-day tasks. For instance, our garbage is picked up every Thursday. I have a reminder on my calendar to go off that morning as a reminder to put the trash out on the curb. This keeps me from waking up in the middle of the night trying to remember what day it is and worried that I may miss the garbage truck. It's also a great way to set reminders to send things like birthday cards or that dentist appointment that you made 6 weeks ago! I hope this helps get you ready and excited for the new year!